R, an Open Source software, has become the de facto statistical computing environment. It has an excellent collection of data manipulation and graphics capabilities. It is extensible and comes with a large number of packages that allow statistical analysis at all levels – from simple to advanced – and in numerous fields including Medicine, Genetics, Biology, Environmental Sciences, Geology, Social Sciences and much more. The software is maintained and developed by academicians and professionals and as such, is continuously evolving and up to date. 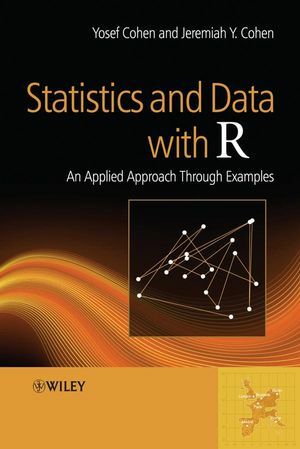 Statistics and Data with R presents an accessible guide to data manipulations, statistical analysis and graphics using R.
A comprehensive introduction to the R language. An integrated approach to importing and preparing data for analysis, exploring and analyzing the data, and presenting results. Over 300 examples, including detailed explanations of the R scripts used throughout. Over 100 moderately large data sets from disciplines ranging from Biology, Ecology and Environmental Science to Medicine, Law, Military and Social Sciences. A parallel discussion of analyses with the normal density, proportions (binomial), counts (Poisson) and bootstrap methods. Two extensive indexes that include references to every R function (and its arguments and packages used in the book) and to every introduced concept. In the 30 years he has been teaching, Professor Cohen has taught a range of subjects from ecology and computer programming to statistics and data analysis with R. The recipient of numerous research grants, he is also the author and co-author of dozens of articles published in a wide range of journals, and has contributed chapters to a number of edited texts. He has also edited and authored four books. Part I: Data in statistics and R.
1.4 Arithmetic operators and special values. 2. Data in statistics and in R.
2.2 Objects that hold data. 2.4 Data import, export and connections. 3.7 Three-dimensional plots and contours. Part II: Probability, densities and distributions. 4. 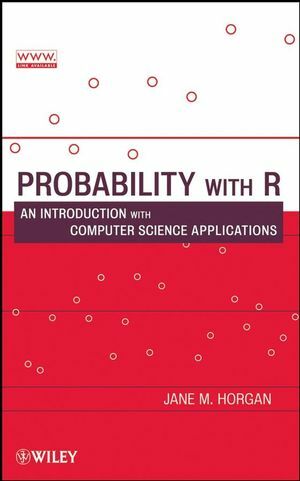 Probability and random variables. 4.2 Trials, events and experiments. 4.3 Definitions and properties of probability. 4.4 Conditional probability and independence. 5. Discrete densities and distributions. 5.5 Variance and standard deviation. 5.9 Some useful discrete densities. 6. Continuous distributions and densities. 6.5 Variance and standard deviation. 6.6 Areas under density curves. 6.7 Inverse distributions and simulations. 6.8 Some useful continuous densities. 7. The normal and sampling densities. 7.2 Applications of the normal. 7.4 Random samples and sampling densities. 7.5 A detour: using R efficiently. 7.6 The sampling density of the mean. 7.7 The sampling density of proportion. 7.8 The sampling density of intensity. 7.9 The sampling density of variance. 7.10 Bootstrap: arbitrary parameters of arbitrary densities. 9. Point and interval estimation. 9.3 Point and interval estimation for arbitrary densities. 10. Single sample hypotheses testing. 10.1 Null and alternative hypotheses. 10.2 Large sample hypothesis testing. 10.3 Small sample hypotheses testing. 10.4 Arbitrary parameters of arbitrary densities. 11. Power and sample size for single samples. 11.3 Power and sample size for arbitrary densities. 13. Power and sample size for two samples. 13.1 Two means from normal populations. 14.3 The model goodness of fit. 14.4 Hypothesis testing and confidence intervals. 14.7 Power and sample size for the correlation coefficient. 15.5 Two-way linear mixed effects models. 16.1 Simple binomial logistic regression. 16.2 Fitting and selecting models. 16.3 Assessing goodness of fit. 17. Application: the shape of wars to come. 17.1 A statistical profile of the war in Iraq. 17.2 A statistical profile of the second Intifada. Over 100 moderately large data sets from various fields, including, ecology, environmental sciences, medicine, biology and social sciences.